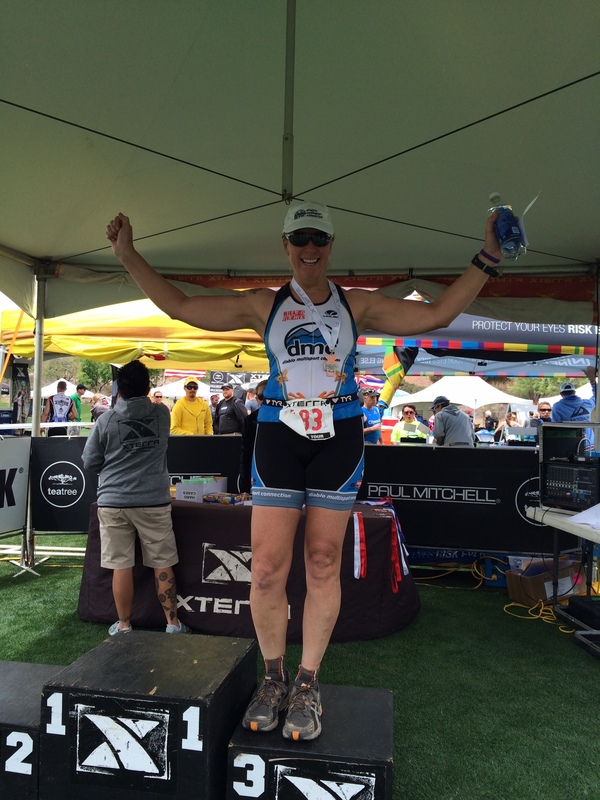 Xterra Lake was a test race for me. I’m signed up for Xterra Maui on Nov 1. This was my first race flying with my bike alone. I’ve flown to other races but I’ve always had my mechanic/husband with me. Tuesday night at home – I get a lesson on taking my bike apart and how to wrap it for our soft bike bags. Wednesday afternoon I catch my flight to Las Vega s.
I get my rental car, stop by the local bike shop on the way to Henderson pick up some lube which was the only thing I forgot, and then I check into my hotel. I’m slated for a short run which I do on the treadmill in the hotel gym. I hit the shower, the grocery store and then I start pulling out my bike. I do great until I get to the derailer. Somehow I got it all twisted and I knew it wasn’t right but I couldn’t see how to get the chain in the correct position. Nothing a quick photo and call to my husband couldn’t undo – he helped me straighten things out – literally. So big accomplishment #1 down. Thursday: I have some friends who are also doing this race, we schedule a time to pre-ride the course. I drive to the race site about 15 minutes from my hotel. We head out to scope out the course. Lake Las Vegas is a man made lake with some beautiful luxury hotels and golf courses surrounding it. 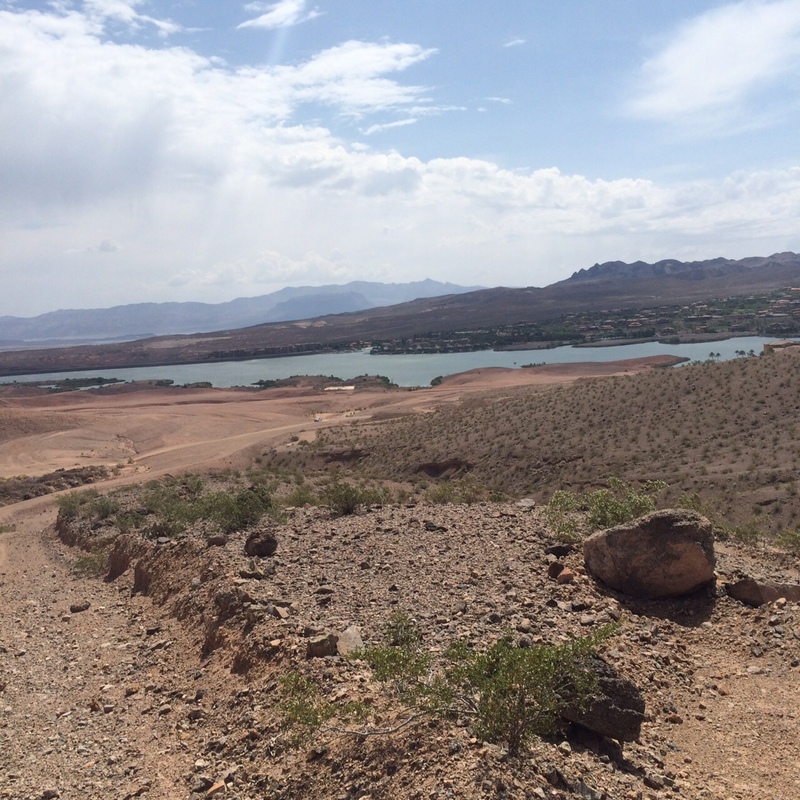 But the Xterra course is a hot, gravely, dusty, rocky, sandy desert landscape. The day is dry and hot under a cloudless blue sky. 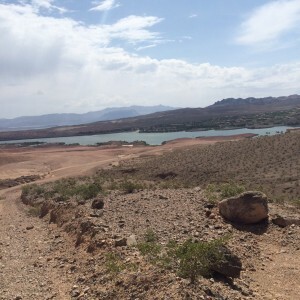 There are loose steep climbs, sharp turns, a very loose rocky ‘chute’ downhill, a sandy river bed and then across a hard sandstone wash dubbed “the lunar landscape”, finally ending up at the shoreline of the lake for a fun, fast single track – heading back to the start (race day will be 2 laps). I admit I’m a bit nervous and intimidated by the rocks and loose terrain. Friday: I head back out to the race site for packet pick up, to scope out the swim area and listen to the pre race talk. It’s warm but very windy. We are all hoping for a calmer day the next day. Saturday: I head to the race at about 6:30 am. It’s calm overcast. I rack my bike and set up my transition. It is determined that the water temp is 68º which is wetsuit legal. I take my Hammer Race Supreme Caps – which I take daily – and nibble on my banana and eat some yogurt. We all put on our wetsuits and start prepping for the swim. The Pros get sent off at 8am, the sprint group goes at 8:30 and the full course age group (which is my race) go at 8:45 Men / 8:48 Women. The swim is a long rectangle, with the short end at the far end, and at the shore – 2 laps with a beach run in between. I get in the water after the sprint group takes off and swim around and get acclimated to the water for about 10 min. Just a bit before our gun time I take a Hammer gel (Montana Huckleberry). At 8:48 our time has come. I start out. I’m actually thinking to myself. “What the heck am I doing here? I hate this swimming thing”… All the way up the first long leg I’m really having to convince myself to keep going. I come up to the first turn buoy and then it’s only a short distance to the second buoy which turns you back toward shore… I’m getting in my grove but still not loving it. I make it to shore, exit, run on the beach about 200 feet, then back in for lap two… now I’m feeling warmed up. I forget about my earlier grumbling and get into my rhythm. And sure enough next thing I know there’s the beach. 3rd Place in Age Group! I exit the water and start heading up the golf cart path to transition. It’s a couple of minute run/walk while stripping off goggles, caps, and wetsuit. I find my bike/transition spot and finish removing my wetsuit. Don all of my bike gear and head out! My earlier nerves from swimming are gone but my bike nerves kick in. Happily I find that from my pre-ride Thursday to race day the trails have gotten some use and much of the worst parts are quite a bit better. 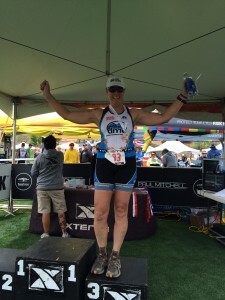 From advice from the pros at the pre-race talk, they encouraged the age groupers to fuel early – I had Hammer Sustain in my bottle and began drinking it. The long gravely chute that I had planned on walking had a clear line which I followed and went right down it with ease (on both laps). I focused on staying strong and pedaling on the flats and before I knew it I was back at the intersection for lap 2. Nerves completely gone now – I’m feeling confident and I push hard. Running is my weakest of the 3 sports so I know I need to gain while I can on the bike. Nearing the end of the bike I see one of my friends and I am able to pass her. Back to transition, and I’m out on the run. Thankfully the overcast has remained and it’s staying fairly cool. Though the wind picked up somewhat. The outbound on a run is always tough, I take another Hammer gel, then begin the climbs. I was feeling pretty tired. The run course was pretty much the same as the bike course so I knew what to expect – but that meant the tough hills came in the first half of the loop. I admit there was some walking. The friend who I had passed on the bike, now got me back and ran ahead. About halfway through I met up with another gal going my same pace and we stuck together and chatted a bit. Nearing the end of the run I was really getting drained, and another runner caught us. Those two had more ‘get up and go’ than I did and I fell a behind. But the end was near so I just kept plugging away. There was a short run on the road back to the finish line so I just concentrated on keeping moving. I was happy to be done! 3:58! My goal was to come in under 4 hours. April training on our beautiful Mt Diablo! 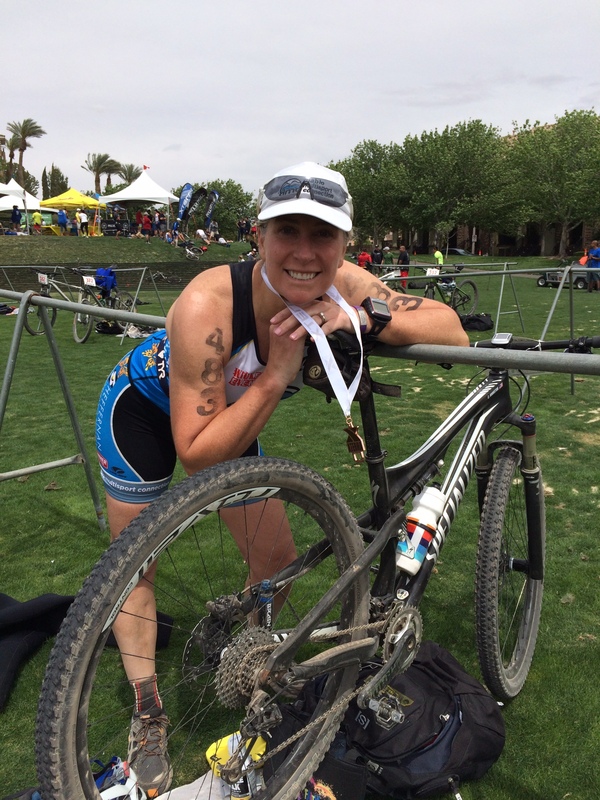 Good job Kelli Rantz, Tanya Parmley, Sue Strause, Julie Goodwin and Amy Bruski (on a road bike again!)!!! Nice work! April 13, 2019 Elaine Morison showing us how it's done on the last climb of her MTB event at the Sea Otter Classic. Gotta love that smile! !